This isn't exactly fair. CoolerMaster's Hyper 101 isn't really designed for the full fruitiness of an i7 920's LGA 1366, but it fitted our test system and was in the office, so we stuck it in. It's really meant for AMD K8, AM2/3 and LGA 775 and 1156 boards, hence the 'Universal' tag. It's a popular cooler and it's easy to see why given the price. 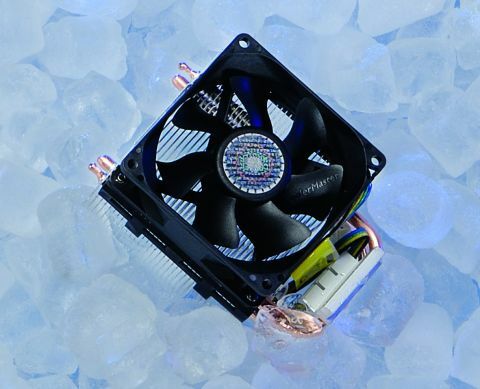 The main rival is Arctic Cooling's Freezer 7 Pro, a similarly sized and similarly popular cooler. Next to the mighy towers of fins in heavy-metal coolers such as Fenrir and Thor's Hammer, the Hyper 101 is a wee beastie. This is good news for many, because full size towers are often difficult to fit in smaller systems. The Hyper 101 is svelte enough to go where others can't. It features Direct Touch for the two heat pipes, where the pipes sit directly on top of your processor, which is a good thing at this price. The Intel fixings are not a masterpiece of design and involved plastic push-pins, which are flimsy and fiddly things that don't bear repeated use. At least the fan slides off, easily and it comes with a set of brackets for a second fan on the other side should you need extra airflow. Another good feature is that it can be fitted to AMD systems in both orientations, so you can get some clearance from your memory sticks if they're too close. It couldn't keep our test system as cool as the big chaps, and it's no wonder. Under idle, it ran at 51 degrees and under load managed 73 degrees. Big tower coolers can manage figures in the 50s under load. It was stable, despite having a maximum TDP of 95W and an i7 920 pushing out a theoretical maximum of 130W, but was just a tad too hot for comfort. We want a wider margin than that for peace of mind. The Hyper 101 is terrifically cheap, but out of its depth running in more demanding applications. It goes to show that you do need to fit proper specified coolers. Stick to the cooler-running processors and it's a regular bargain, though.